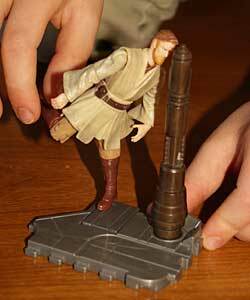 As one of the greatest Jedi's alive, Obi-Wan knows how to do a great Jedi Kick. And Hasbro has turned that into an action figure that can do the same! This is the basic setup. 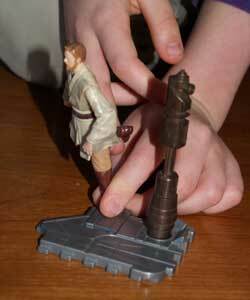 First you put Obi-Wan onto the base, by sticking the peg into the hole in his foot (ouch!). Then, very carefully, balance the pole onto the base. There is very little to keep the pole from falling down, so do the next steps as careful as possible! Hold the right foot (the foot on his right is the right foot, not the left foot, which is the wrong foot! ;-D) and tip Obi-Wan over. You can see me holding the base, because other wise a small movement of the base would tip over the pole. And then you'd have nothing to kick of course! 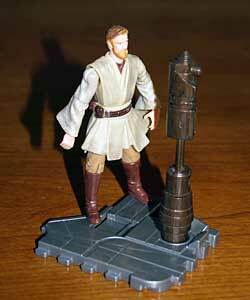 Ok, here I'm moving Obi-Wan around more. I don't remember exactly, but I think you need to turn it at least a full turn. 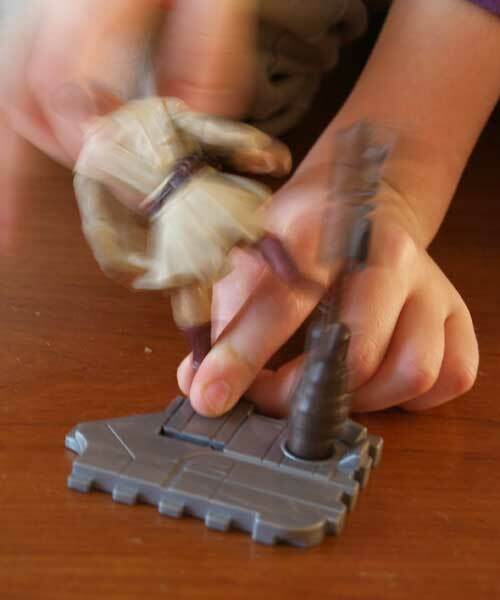 The only hard part of doing this, is doing it without tipping over the pole you're supposed to kick... And how to set it up again while holding the action figure with 2 hands. I haven't figured it out yet!